Brett Merchant’s walk along the Highway of Tears underscores the message delivered by both Aboriginal and non-Aboriginal leaders: That the issue of murdered and missing Indigenous women and girls is a Canadian concern. Merchant, from Cranbrook, is non-Indigenous. “I think it’s huge,” said Shannon Girling-Hebert, administrator of quality assurance and service integration with the Ktunaxa Nation. She said Merchant has “always had a commitment and connection with First Nations people because his father instilled that value in him. Girling-Hebert said Ktunaxa Nation Council became involved after Debbie Whitehead, director of the social investment sector, personally contributed $50 and commented on Merchant’s Gofundme page. “[U]tmost respect from my family and the community of Cranbrook,” she wrote. Whitehead decided supporting Merchant was something her First Nation should also do. 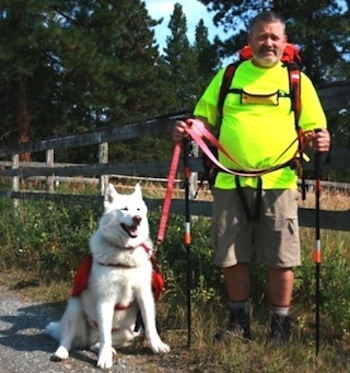 Ktunaxa Nation Council was so moved by Merchant’s efforts, it gave $1,000 for his 1,236 km trek. Council also challenged other First Nations to help out, whether through funds, moral support, or food and water. The Carrier-Sekani Tribal Council stepped up, paying for a hotel room for Merchant when he arrived in Prince George Sept. 13 night. But his walk on the Highway of Tears (Highway 16), which began on the B.C.-Alberta border on Sept. 1with the goal of reaching Old Massett on Haida Gwaii by 12 noon Dec. 31, was never about raising money. It was always about the lives, many of whom were young Aboriginal women that were lost along the highway. It’s about connecting people on the most basic level. Merchant grew up in Cranbrook. His parents owned a store and, as a young boy, it was Merchant’s job on the occasional Saturday morning to wake up the people who slept in the back alley. Those people were Indigenous. “It was in the back of my mind that something was different here,” said Merchant, and he started learning more about the people in the nearby St. Mary’s Indian Band. “I started to learn about residential schools and stuff…Not only beatings and rapes… but your language is taken away, your culture is taken away, and quite often your parents are taken away,” he said. With his health “slipping” – Merchant has SLE lupus, early onset dementia and diabetes – he decided now was the time to make a difference. He sold everything he owned from is small apartment in Kimberley, with the exception of his bed, and Merchant and his newly-acquired dog-companion Kura set off on the road. It wasn’t until he hit the trail that he realized his journey was coinciding with the start of the national inquiry into murdered and missing Indigenous women and girls. Along with the monetary donations that are coming in – his Gofundme page sits at $3,430 after one month with 25 separate donations – he is being greeted along the trail and even joined for some legs. Merchant says he would like to use the money to build a shelter for Indigenous women or to help supplement the cost for transportation. Many of the women who went missing were hitchhiking along Highway 16. Merchant sees his journey as one more step in the goal of improving the lives of Indigenous people. “We don’t need to start. What we need is to get going and not stop,” he said.